The leading global Internet brand and one of the most trafficked Internet destinations worldwide, Yahoo! has announced the upcoming launch of its new Yahoo! Mobile service that aiming to be a highly-personalized mobile starting point to the Internet. Yahoo! Mobile will be available on the mobile Web as an app developed for iPhone, and as an application developed for smartphones from Nokia, RIM, Samsung, Sony Ericsson and Motorola as well as the mobile phone which powered by Windows Mobile. Yahoo! Mobile will offer an open environment within which users can bring together their favorite content and services from across the Internet with features that includes Discover, Stay Connected and Stay Informed. Discover – Yahoo! oneSearch that provides the most current and relevant answers as you need, and Today that provide the most interesting stories buzzing on the Internet right now or selected by Yahoo!’s editorial team. Connect – Yahoo! oneConnect that designed to provide users everything they need to stay in touch with the people that include Email, Pulse, Messenger, Address Book and Calendar. Stay Informed – Yahoo! News that displays breaking headlines across popular topics and Yahoo! onePlace that access and manage your favorite content from one location. Yahoo! oneSearch with Voice – allows users to launch searches by simply speaking. Maps – Powerful improved tools that let users locate, learn about and get directions to points of interest. 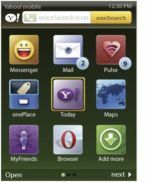 Opera Mini 4.2 – An integrated version of the world’s most popular mobile web browser, with easy return to the Yahoo! Mobile app, that launches when web site access is needed. Widgets – Enhanced mobile-optimized experiences for services from Yahoo! and other brands. Users can browse, add and remove these at anytime according to their tastes. However, Yahoo! Mobile initially will be available today through a managed beta program, while the general version is expected to be in Q2 2009.